Vada's Blog Stamp Inks and Paper : Spellbinder Die and Martha Stewart Punches. Had some free time to play with punches. 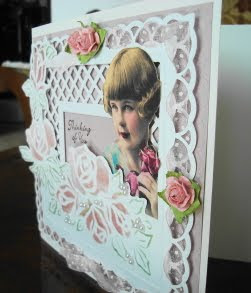 The Roses is a die from Spellbinders, which I inked with Tim Holtz’s distress inks and added white seed pearls. 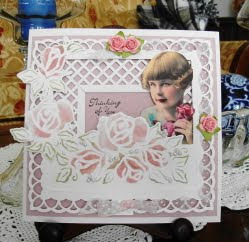 The outside border is the Layered Arches punch and corner from Martha Stewart and the inside punch is Garden Trellis also from Martha. The little girl graphic is from “Clearly Vintage”. Thinking of you is from CTMH. Just gorgeous Vada!!! I have one set of MS punches but certainly have not gotten the hang of using them... you have done a beautiful job!!! this is a truly sweet card. thanks for sharing.